GSA Member Jeff Leips presents his research on aging using Drosophila. 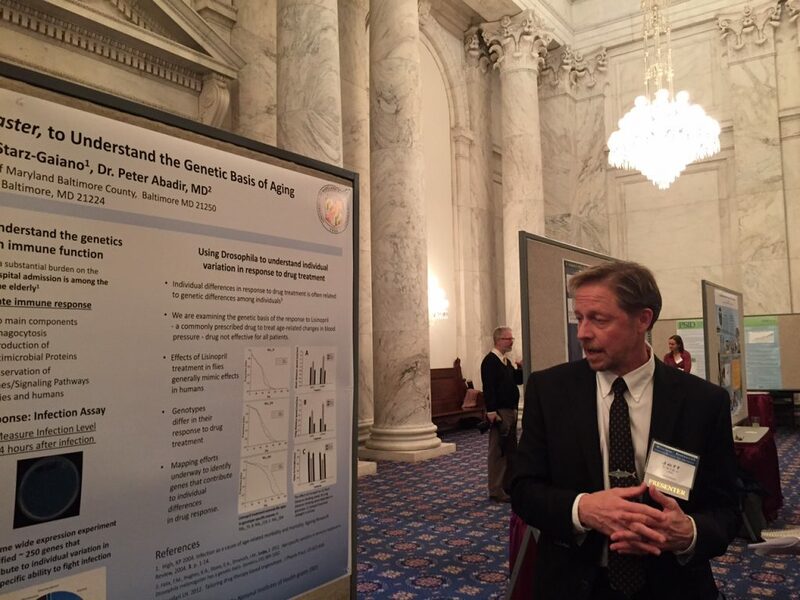 This month, GSA member Jeff Leips (University of Maryland, Baltimore County) packed up a few his fruit flies and brought them to the Russell Senate Office Building in Washington, DC. There he joined other researchers, including David A. Scholnick of “shrimp on a treadmill” fame to present at the Wasteful Research? Looking Beyond the Abstract poster session co-hosted by the Coalition to Promote Research and the Coalition for the National Science Foundation. The event connected policymakers with scientists whose research may seem frivolous at first blush, but are making important contributions to several fields of science. For example, Leips uses fruit flies to study the genetics behind the aging process. Representatives from the National Institutes of Health (NIH) and the National Science Foundation (NSF) also participated, explaining their peer review and grant selection processes to Congressional staffers and other attendees. In recent years, agencies have come under fire for funding research projects with silly names or seemingly useless applications. Some members of Congress point to such projects in annual “Wastebooks”, which index wasteful government spending across all agencies. This has led to calls for more hands-on oversight, especially at NSF, that could impact the agency’s ability to set research priorities. By providing policymakers with the opportunity to learn more about the project behind the titles and abstracts, attendees hoped to change the perception of government investments in scientific research. Read more about this event here. As members of Congress returned to Capitol Hill following their Spring recess, so too did budget negotiations as appropriators move forward with efforts to approve 2017 spending bills by mid-July. The Senate Appropriations Committee, chaired by Thad Cochran (MS) set the spending levels for each of its subcommittees following the spending guidelines set by the Bipartisan Budget Act passed last fall. Notably, subcommittees which fund NIH and the USDA Agriculture and Food Research Initiative (AFRI) will see an overall reduction in budget allocations while subcommittees tasked to fund NSF and Department of Energy will see increases (See table below). The Senate-approved Commerce, Justice, and Science spending bill increased funding for NSF by $46 million and included language in support of fundamental research; however most of the increase is expected to go toward the design and construction of regional-class research vessels, making most directorate level budgets flat for next year. Meanwhile in the House, AFRI received $375 million ($25 million increase over Fy16) for FY17 as a result of the House-approved Agriculture, Rural Development, Food and Drug Administration, and Related Agencies Appropriations bill. This falls short of the President’s budget request that included $325 million in mandatory funding, which the House chose to reject. GSA submitted written testimony to the House and Senate Commerce, Justice, and Science Subcommittees in March requesting a budget increase for the National Science Foundation in order to support fundamental research, workforce development, and shared research resources. Read the full statement here. As GSA continues to ramp up its policy efforts on behalf of our members, we want to make sure that your concerns are a part of our policy agenda. The next time you see an article, op-ed, opinion piece or policy proposal that you think the GSA should weigh-in on, send your opinion along with a link to more information to us at Policy@Genetics-GSA.org. Mushroom modified by CRISPR to bruise less falls outside of GMO regulations. This scientist works with tissue from aborted fetuses. Congress has come calling. Genetically modified mosquitos are poised to join the fight against the spread of the Zika virus.